As one of my favorite professional photographers, Rick Sammon, often says, “What good is shooting images, if all you do is store them on your computer.” I practice what Rick encourages by posting some of my favorite images on my websites and blog, thereby sharing them and my passion for photography and the natural world. My websites have over 430,000 views and my blog over 86,000 views. My blog receives an average of 200 daily visitors with most views from people in the United States, but also from people in many countries worldwide. I greatly appreciate such activity and the many comments people provide. Those frequent visits have been generating many requests for use of my images in community reports and newsletters, presentations and reports of nonprofit organizations, newspapers and magazines, and informative displays in parks and preserves. Lately, I have been receiving weekly requests for use of my images. I would like to share two recent requests, which are the subject of this article, that I am particularly excited about. Above is the front page of the Local and State section of the Gainesville Sun (click on image to read caption), the local newspaper of Gainesville, Florida. 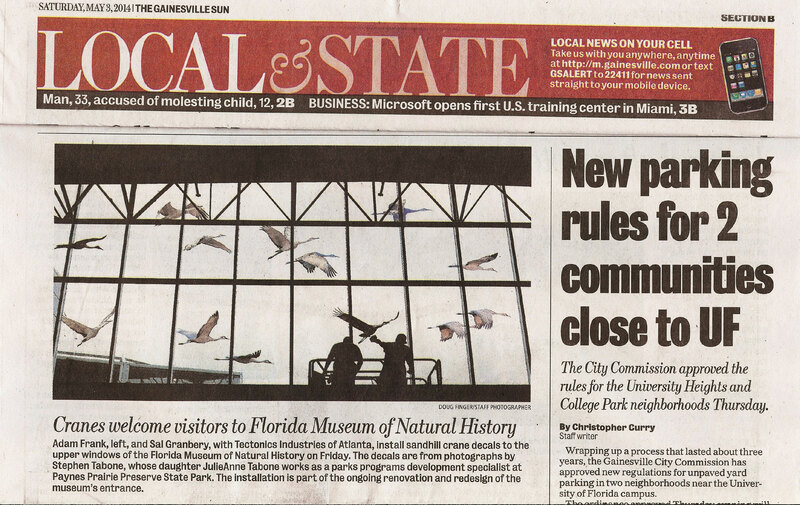 As indicated in the May 3, 2014, article, the Florida Museum of Natural History is using my images of inflight Sandhill Cranes that I photographed at Paynes Prairie Preserve State Park. The Prairie is located just south of Gainesville. The museum is using the images as part of a permanent exhibit in its entrance, which is currently being renovated. There is another large set of similar windows in the atrium lobby adjacent to the one shown below that also contains the flying crane images. Below are are two images of one set of the windows taken by my daughter shortly after the Sandhill Crane window exhibit was completed. Recently, I received a request from a representative of the Oshkosh Zoological Society to use my River Otter images in a new information sign at their otter exhibit. I sent them several images to choose from, and yesterday, I received a copy of a proof of the exhibit information sign (below) to be used at the Menominee Park Zoo. The proof is shown below. They will be sending a photo of the sign at the exhibit when it has been installed. I sell prints of varying sizes of my images from my website. I am not a professional photographer, meaning I do not make my living from photography. I am a photographer because I love photography and what I photograph. However, I have sold many prints, and they are hanging in numerous homes and commercial and noncommercial offices and facilities. If you have ever considered owning one or more of my images printed, for the remainder of this month and the month of July, any size print of any image can be selected and printed at only the cost of printing, plus $10.00 that will be donated to the Nature Conservancy. For example, a 12″ x 18″ print on professional grade photographic paper will cost $11.49 (my cost to print) plus the $10.00 donation for a total of $21.49, plus UPS shipping. The images are printed by MPIX, the largest professional photography lab in the country. Whenever I print one of my images, I use MPIX. The quality of their prints is impeccable. Prints are never rolled, but are shipped flat, plastic wrapped and protected within the shipping container, and typically arrive within 4 to 5 business days. Why am I making this offer? Solely to support the Nature Conservancy and do as Rick Sammon recommends, share my passion for photography and nature with those that follow my blog and enjoy my photography. I hope you take advantage of this offer and help the Nature Conservancy with your $10 donation. 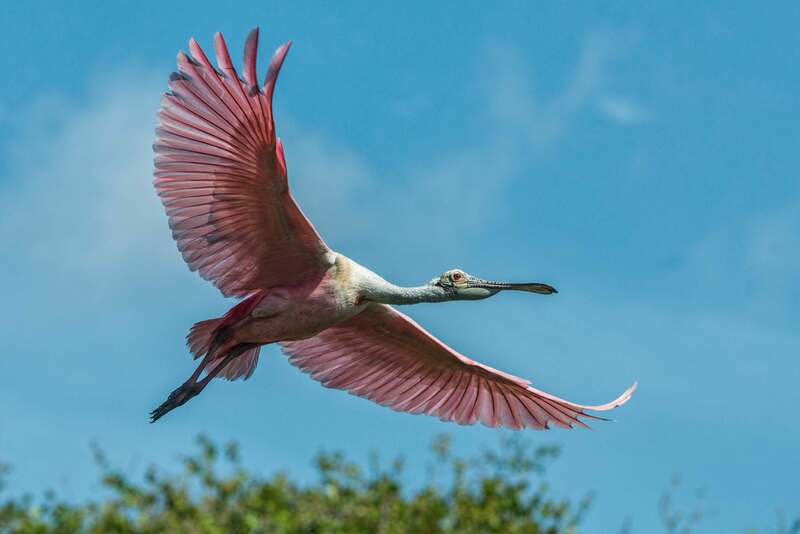 In closing, below is an image of a Roseate Spoonbill I photographed in May while in Florida. I had a very successful trip photographing wildlife and landscapes and will be posting some of the images over the next couple weeks. This entry was posted in Nature, Wildlife and tagged Florida Museum of Natural History, Oshkosh Zoo, Spoonbill. Bookmark the permalink. You are absolutely right! And you make me feel bad as well. I store all the photos in my computer!!!! The Sandhill Crane window exhibit is wonderful. Lovely! Again, congratulations on the recognition of your talent. And what a bargain you are offering! I think you are going to be swamped with orders. The Nature Conservancy will really benefit from what you and your readers are doing. Great idea! Congratulations on getting the recognition that your stunning photos deserve! Your work is positively..absolutely..superb. I’m not a photographer but I recognize talent and Mr. Tabone you have spread your wings and you will rapidly soar. I do often wonder, how did he do that? But don’t tell me let me guess and speculate. Well done! Although a good recommendation, as I pointed out in this article, I am not into photography to make money, only quality photos while enjoying the natural world and sharing them and the experience with others. Well done and congratulations, Steve! I always enjoy your photos, or I should say, your works of nature-art! I love that your artistry is getting recognition as you truly an artist!!! Bravo! I hope you get swamped with requests for your work and the Nature Conservatory reaps the benefits. Congratulations on continuing to be “published”. Recognition in its many forms lets you know that others appreciate your work. Keep up the great shooting. How wonderful! And what a fantastic idea to give extra proceeds to the Nature Conservancy – one of my favorite charities. Best wishes and continued success! Congratulations! The new window at the museum looks incredible….I’ll have to plan another trip up that way to see it! Great way to benefit the Nature Conservancy. A great way to share and spread your passion and help the Nature Conservancy at the same time. You stand out as being very unselfish which can only add to the quality of your results. Hats off to you!